Curly Twirls Frizz Blitz Spritz uses the magic of Argan Oil to eliminate frizziness while creating a flexible hold for your curly twirly hair style. Use it to refresh and revitalize dry hair, or spritz it on to maintain a gentle hold on your style. 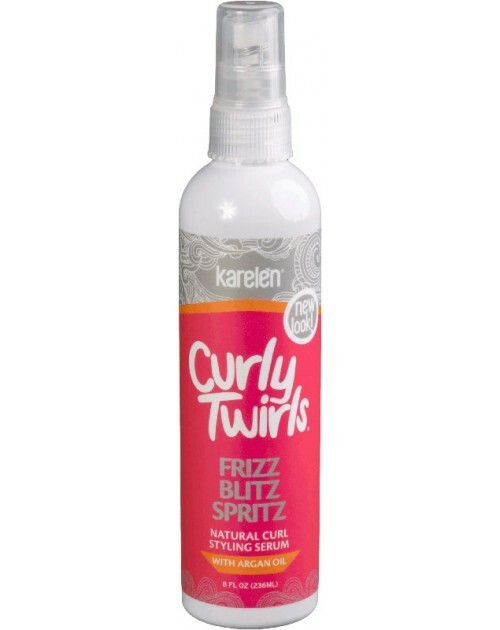 Used regularly, Curly Twirls Frizz Blitz Spritz keeps hair moist, healthy, manageable and ever so luscious! FOR THICK CURLS: Spray on wet or dry to add moisture and help keep hair manageable. Provides a gentle, natural-looking hold. FOR LOOSE, WAVY CURLS: Use on wet or dry hair to hold for styling, and to keep hair moist. Can also be used as a setting agent with rollers to create a loose, bouncy curl.